If you have been following our blogs recently, you are likely aware of how important garages and garage doors are to homes. However, just as garages are important to residential buildings, they also are important for many commercial buildings. A business may use a garage for storing their inventory, protecting company cars, and some even use garages for extra work space! With all the benefits that a garage can bring to some businesses, it is important to ensure that the right garage door is used. Depending on the company and their business operations, choosing a quality commercial garage door is important. Businesses that utilize garages need garage doors that are reliable and will offer protection or the business could end up suffering. For example, imagine missing a high-priority shipment because your business couldn’t get your product out of storage. In addition to being a danger to business operations, a faulty commercial garage door is likely to break or malfunction, causing costly damages, repairs, and even liabilities. Plus, another important consideration when selecting a commercial garage door is security. If a business’s garage door is old, flimsy, and has efficient locking mechanisms, there is really nothing preventing thieves from getting in and accessing a business’s property. No business owner wants to find inventory missing because a criminal gained access to a business through the garage. In addition, businesses may be attracted to budget-friendly garage doors. While this may save companies money initially, the costs of constant repairs and inconveniences make budget commercial garage doors not a very good bargain at all. For businesses in Indiana who need commercial garage doors in Indianapolis — or the surrounding areas — they need to call a reliable garage door company that specializes in commercial garage doors; they need to call Garage Door Doctor! At Garage Door Doctor, we offer quality commercial garage doors that will not break a business’s budget and will not require as many repairs as a cheap garage door might. Whether you need a commercial garage door for commercial, warehouse, or industrial applications, Garage Door Doctor is the choice to make for commercial garage door installation. And because choosing a commercial garage door is important, we are going to go over some things for business owners to consider when choosing a garage door for their business. As mentioned, different types of businesses require commercial garage doors for a variety of different purposed. Firefighters need them for truck storage and quick exiting, while retail stores may need them for their loading docks. Due to the different uses of commercial garage doors, they are designed to serve various industry-specific needs. However, with so many types of doors and features to select from it can be hard to pinpoint which commercial garage door is best for your company. 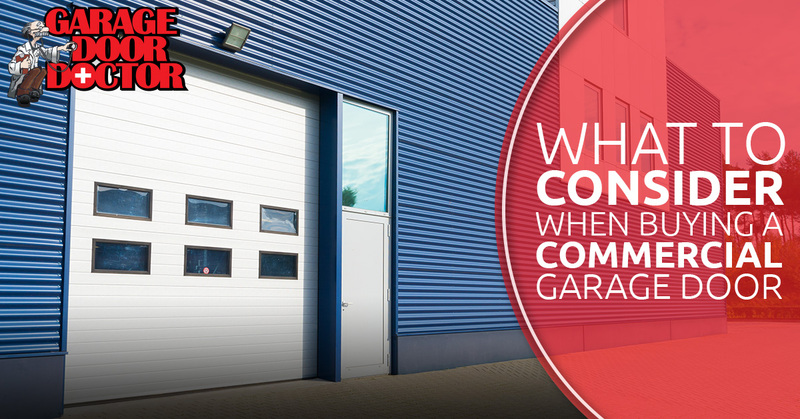 When you are thinking about purchasing a commercial garage door for your business, consider the following questions to ensure you are fully prepared to select the best door. Companies should first determine what their budget is. As a business owner, you should ensure that a sufficient amount of research is done and that you are aware that the more durable and high-speed a commercial garage door is, the more expensive it will likely be. However, garage doors are a big investment and companies will want to choose the best possible option. For most uses of commercial garage doors, appearance isn’t usually a deciding factor. However, commercial garage doors are becoming more of a trend in modern restaurants and offices to add aesthetics to their current layout. It is important to determine how important the type, color, and texture of a commercial garage door will be to your business. It is not only important to consider what type of door you want, but also what kind of commercial garage door you need. If your business is a fast-paced work environment and the door will be used multiple times throughout the day, you’ll want to choose a door that is high-performing, fast, and reliable. Is there an opening size requirement? Of course, businesses will want to make sure they choose a commercial garage door that will fit the height and width requirements of their building. It is important to consider headroom and other structural accommodations that may need to be made. Do you need a door with windows? For some companies, having windows on a commercial garage door is not necessarily a high-priority. However, for some businesses, having a commercial garage door with windows can add style and value, as windows can act as a promotional display. For example, large, full view, aluminum doors are great for fire stations, auto dealers, modern restaurants, and leisure spaces — perfect for utilizing dual-side viewing and natural lighting. Depending on the industry your business is in, and the area of the building’s location, it is essential to consider the security risks your business may face.While most commercial garage doors are designed with standard security features, businesses who are vulnerable to break-ins may want to consider a door with a better security rating. Depending on what a business’s garage is used for, temperature regulations may be required for employees or inventory, and buying an insulated door is a great choice. In addition, thermal garage doors will help businesses conserve energy as inside temperatures are less likely to escape. Are you purchasing the door from a reputable company? It is important to ensure that your commercial garage door installation is being done by a fully trained, certified, and professional garage door service. With commercial garage doors weighing so much, experience is always necessary. Do you have a garage door repair plan? It’s one thing to have a commercial garage door installed, but as a business owner, you’ll want to establish a maintenance and repair plan. It doesn’t matter how durable or high-performing a commercial garage door may be, friction, tampering, and wear can cause a garage door to become vulnerable. Planned garage door maintenance and repairs can ensure that a business’s operations are safer and more efficient. For businesses that need a commercial garage door in Indianapolis and the surrounding areas, Garage Door Doctor Can help you select the best commercial garage door for your business. We have been providing businesses throughout Indianapolis and the surrounding areas with professional garage door services. To receive further information, or to receive a free commercial garage door quote, contact our team today!